When it comes to home improvement, sometimes a proper cleaning can be transformative, especially when it comes to the exterior. Excessive grime can obscure even the most beautiful architectural details. Additionally, prolonged exposure to dirt can cause some materials to deteriorate. If you want to keep the exterior of your home in good shape, consider a few cleaning tasks to keep your home looking beautiful. Due to busy schedules, homeowners often miss the accumulated dust on their doors. To keep them looking brand new, wipe them down once or twice a year. Always dust first before using a cleaning solution. A mixture of water and a few drops of mild dish soap usually works. For persistent stains, use a solution that’s formulated for the exact type of finish, whether it’s paint or sealant. Clean windows not only look better, but they also bring in natural light. Like the doors, windows should be thoroughly washed, inside and out, at least once or twice a year. If you’ve had excessive rain, harsh winds, or humid weather, you may want to wash them seasonally. Take this time to inspect your windows for cracked seals or damages which may indicate your windows need to be replaced. 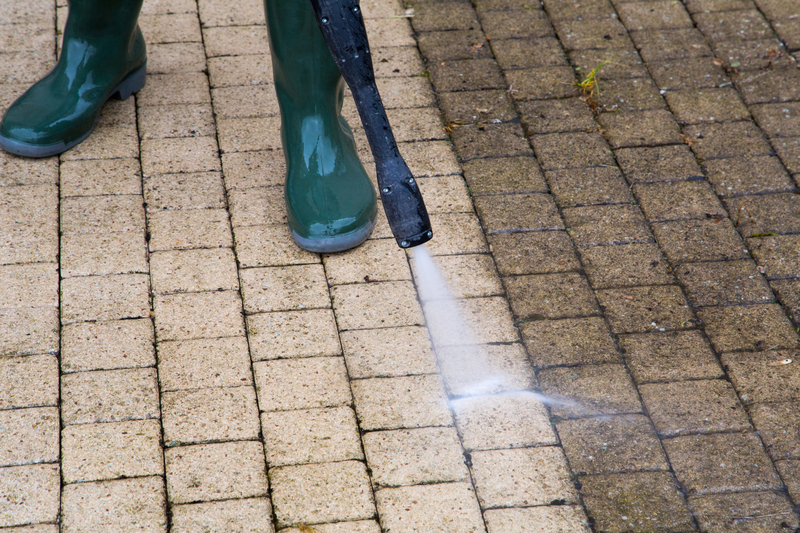 Whether it’s layered in grime or caked with mud, most outdoor flooring surfaces can benefit from a power wash. It can brighten up any stone pavers and concrete. Basic power washing tools can be found at most home improvement stores, but if you need a deeper clean, you may need to contact professionals. Anytime you notice chipped paint or scuffs on the siding, molding, columns, or any other exterior feature, clean it up and do a quick touch up. If it's been a few years, the color may have faded significantly. If this is the case, you may need to repaint or choose a lighter, less saturated color. This is also a good time to catch any wear and tear which may indicate your home is due for new siding. Finally, invest in gutter cleaning. Because they allow rainwater to flow more freely, clean gutters are essential for protecting your roofing and siding from water damage. Due to their high location, for safety purposes, it may be best to leave this job to the professionals. If you’re in Nebraska’s Lancaster County and need more than just cleaning done to the outside of your home, you can rely on Neemann and Sons, Inc. for replacement windows and siding. Based in Lincoln, this home improvement contractor has served the area for over 35 years. They’re licensed, insured, and proud bearers of numerous roofing certifications. For a full list of their services including gutter cleaning, please visit their website. If you’d prefer to speak to someone directly, call them at (402) 423-4853 for a free estimate. Other Announcements, Events and Deals from Neemann & Sons Inc.